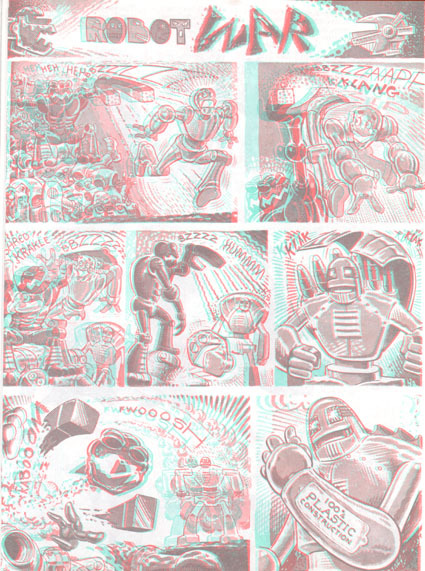 THE 3-D ZONE was the catch-all title for various comics published by 3-D maestro Ray Zone in the 1980s, reprinting a variety of classic comics with 3-D effects. This issue the focus was on the long-running humour comic book CRACKED, including some classic work by the likes of John Severin, Bill Ward, Jack Davis, Bill Everett, Basil Wolverton and Russ Heath, as well as some more recent work. Oddly, Ditko's actually among the "more recent work" contributors, as this issue includes the first "Robot War" page he did a few years before, from CRACKED #218 . As usual for the feature, it's a wordless but sound-effect filled gag about the never-ending conflicts among some mechanical men. The full 3-D version, which I'm told works on computer monitors, is below (so whip out your 3-D glasses), I've "2-D-ized" the bit for the close-up. I really like the lettering of the sound effects in these pages, presumably done by Ditko since they're fully integrated into the artwork and resemble what you see in his independent work.